مالکی, علی, صادقی, سحر. (1397). معرفی تجهیزی جدید جهت اعمال مؤثر تحریک لرزشی برای ثبت پتانسیل برانگیخته حس‌ تنی حالت ماندگار (SSSEP). مجله صوت و ارتعاش, 7(13), 56-65. علی مالکی; سحر صادقی. "معرفی تجهیزی جدید جهت اعمال مؤثر تحریک لرزشی برای ثبت پتانسیل برانگیخته حس‌ تنی حالت ماندگار (SSSEP)". مجله صوت و ارتعاش, 7, 13, 1397, 56-65. مالکی, علی, صادقی, سحر. (1397). 'معرفی تجهیزی جدید جهت اعمال مؤثر تحریک لرزشی برای ثبت پتانسیل برانگیخته حس‌ تنی حالت ماندگار (SSSEP)', مجله صوت و ارتعاش, 7(13), pp. 56-65. مالکی, علی, صادقی, سحر. معرفی تجهیزی جدید جهت اعمال مؤثر تحریک لرزشی برای ثبت پتانسیل برانگیخته حس‌ تنی حالت ماندگار (SSSEP). مجله صوت و ارتعاش, 1397; 7(13): 56-65. 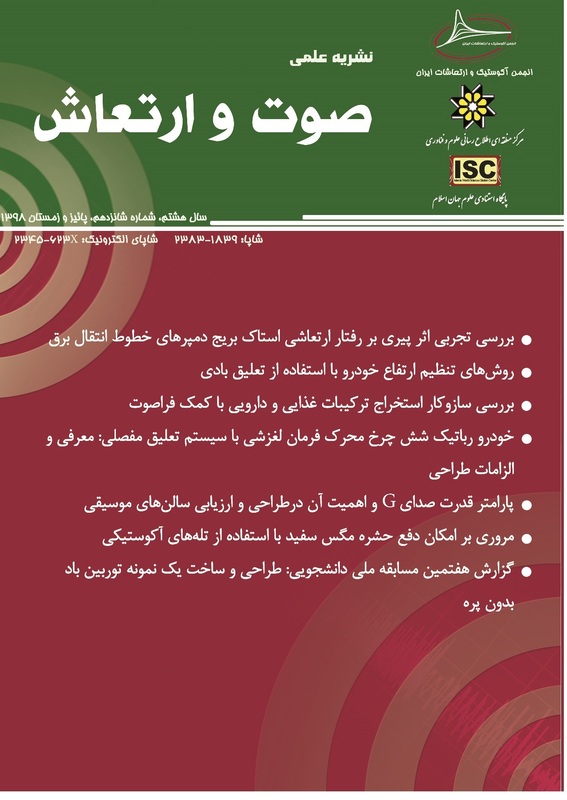 از موضوعات مهم در ثبت پتانسیل برانگیخته حس‌ تنی حالت ماندگار (SSSEP[i])، چگونگی اعمال تحریک می‌باشد. گرفتن موتور در دست سوژه، سبب تغییر شکل لرزش آن می‌شود. استفاده از ابزارهای گوناگون به منظور اتصال موتور به انگشت نیز مانع حرکت آزادانه موتور شده و با احتمال تغییر سطح تماس موتور با انگشت در حین آزمایش همراه است. هدف این مقاله، معرفی تجهیزی جدید به منظور اعمال مؤثر تحریک لرزشی می‌باشد. سیستم ارائه تحریک شامل یک موتور لرزشی و تجهیز اسفنجی جدیدی جهت اعمال تحریک می‌باشد. تحریک‌ لرزشی در فرکانس‌های 21، 23 و 25 هرتز به انگشت اشاره دست سوژه اعمال گردید. بازشناسی فرکانس با روش‌های CCA[ii] و LASSO صورت پذیرفت و میانگین صحت بازشناسی برای پنجره‌‌‌های زمانی هشت، چهار و دو ثانیه‌ای گزارش گردید. نتایج نشان داد جایگذاری موتور درون پایه و قرارگیری انگشت بر روی سطح پایه، موجب کاهش فشار انگشت بر لرزش موتور، حرکت آزادانه موتور و پایداری سطح تماس می‌شود. استفاده از اسفنج در طراحی پایه نیز با اعمال تحریک جانبی در کنار تحریک مستقیم، کارآیی را افزایش می‌دهد. با استفاده از تجهیز پیشنهادی، امکان اعمال تحریک به شیوه مؤثر در سیستم‌های رابط مغز-رایانه (BCI[iii]) مبتنی بر پتانسیل برانگیخته حس تنی حالت ماندگار (SSSEP) فراهم گردیده است. آهنین‌جان، فاطمه.، مالکی، علی. ” توسعه یک سیستم واسط مغز-کامپیوتر مبتنی بر پتانسیل برانگیخته بینایی حالت ماندگار برای تایپ متون فارسی “، مجله دانشکده پزشکی اصفهان، س. 34، ش. 393، پاییز 1395، ص. 918-914. Choi, Inchul, Kyle Bond, Dean Krusienski, and Chang S. Nam, "Comparison of stimulation patterns to elicit steady-state somatosensory evoked potentials (SSSEPs): implications for hybrid and SSSEP-based BCIs", Paper presented at the IEEE International Conference in Systems, Man, and Cybernetics (SMC), 2015. Nam, Yunjun, Bonkon Koo, and Seungjin Choi, "Spatial patterns of SSSEP under the selective attention to tactile stimuli in each hand", Paper presented at the International Winter Workshop on Brain-Computer Interface (BCI), 2014. Smith, Dante J., Lenny A. Varghese, Cara E. Stepp, and Frank H. Guenther, "Comparison of steady-state visual and somatosensory evoked potentials for brain-computer interface control", Paper presented at the 36th Annual International Conference of the IEEE in Engineering in Medicine and Biology Society (EMBC), 2014. Pokorny, Christoph, Christian Breitwieser, and Gernot R. Muller-Putz, "A tactile stimulation device for EEG measurements in clinical use", IEEE transactions on biomedical circuits and systems, Vol.8, no.3, 2014, pp.305–12. Nam, Yunjun, Andrzej Cichocki, and Seungjin Choi, "Common spatial patterns for steady-state somatosensory evoked potentials", Paper presented at the 35th Annual International Conference of the IEEE in Engineering in Medicine and Biology Society (EMBC), 2013. Kim, Keun-Tae, and Seong-Whan Lee, "Steady-state somatosensory evoked potentials for brain-controlled wheelchair", Paper presented at the International Winter Workshop in Brain-Computer Interface (BCI), 2014. Lugo, Zulay R., Javi Rodriguez, Alexander Lechner, Rupert Ortner, Ithabi S. Gantner, Steven Laureys, Quentin Noirhomme, and Christoph Guger. "A vibrotactile p300-based brain–computer interface for consciousness detection and communication." Clinical EEG and neuroscience, Vol.45, No.1, 2014, pp.14–21. Ortner, R., Z. Lugo, R. Pruckl, C. Hintermuller, Q. Noirhomme, and C. Guger, "Performance of a tactile P300 speller for healthy people and severely disabled patients", Paper presented at the 35th Annual International Conference of the IEEE in Engineering in Medicine and Biology Society (EMBC), 2013. Pokorny, Christoph, Christian Breitwieser, and Gernot R. Müller-Putz, "The role of transient target stimuli in a steady-state somatosensory evoked potential-based brain–computer interface setup", Frontiers in neuroscience, Vol.10, 2016, p.152. Soto-Faraco, Salvador, Angelica Ronald, and Charles Spence, "Tactile selective attention and body posture: assessing the multisensory contributions of vision and proprioception",Perception & Psychophysics, Vol. 66, No.7, 2004, pp.1077–1094. Lloyd, Donna M., Natasha Merat, Francis Mcglone, and Charles Spence, "Crossmodal links between audition and touch in covert endogenous spatial attention", Perception & Psychophysics, 2003, Vol.65, No.6, pp.901–924. https://www.precisionmicrodrives.com/sites/default/files/306-108-datasheet.pdf (accessed Jul 24, 2017). Ahn, Sangtae, Kiwoong Kim, and Sung Chan Jun, "Steady-state somatosensory evoked potential for brain-computer interface—present and future", Frontiers in human neuroscience, Vol.9, 2016, p. 716. Siegelbaum, Steven A., and A. James Hudspeth, “Principles of neural science”, Edited by Eric R. Kandel, James H. Schwartz, and Thomas M. Jessell. Vol. 4. New York: McGraw-hill, 2000. Nangini, C., B. Ross, F. Tam, and S. J. Graham, "Magnetoencephalographic study of vibrotactile evoked transient and steady-state responses in human somatosensory cortex", Neuroimage, Vol.33, No.1, 2006, pp.252–262. علیرضایی علویجه، مرضیه.، مالکی، علی، ”روش همبستگی با پیش‌تنظیم بر اساس CCA برای سیستم واسط مغز-کامپیوتر مبتنی بر “SSVEP، مجله مهندسی پزشکی زیستی، س. 10، ش. 2، تابستان 1395، ص. 196-187. Bin, Guangyu, Xiaorong Gao, Zheng Yan, Bo Hong, and Shangkai Gao, "An online multi-channel SSVEP-based brain–computer interface using a canonical correlation analysis method”, Journal of neural engineering, Vol.6, No.4, 2009, p.046002. Tello, Richard MG, Sandra MT Muller, Teodiano Bastos-Filho, and Andre Ferreira, "A comparison of techniques and technologies for SSVEP classification", Paper presented at the 5th ISSNIP-IEEE Biosignals and Biorobotics Conference: Biosignals and Robotics for Better and Safer Living (BRC), 2014. Zhang, Yu, Jing Jin, Xiangyun Qing, Bei Wang, and Xingyu Wang, "LASSO based stimulus frequency recognition model for SSVEP BCIs", Biomedical Signal Processing and Control, Vol.7, No.2, 2012, pp.104–111.